The street scene looking west down the High Street from outside The Sun public house, with a local bobby standing in the road. Not something anyone would do today! The store on the extreme left, with the bicycle outside, was then 109 High Street and a branch of Borough Stores whose proprietor was Charles Burgess. The main shop was at the far end of the High Street with another branch in Farncombe and additional premises in Haslemere, Hindhead, Liphook and Woking. The pillar, one of a pair, is still in situ today (2018). Next comes the "yard", or through-way, which leads up to the Queen Street car park although at that time it would have presumably gone past the garden of the Square (see below) as that garden became the car park. The boots and shoes we can see displayed down the front of the next store belonged to Hilton's shoe shop, then at 107 High Street. Although we can't see the property itself, the greenery and railings a little further along were in front of the lovely old timber framed house known as The Square. The occupants over the years have included Miss Caroline Girdlestone, sister of a Charterhouse School housemaster. Dr. Bertram William Bond, a popular G.P. who lost his son in the Great War, was afterwards there for a number of years. In more recent times it housed the Square Surgery but the doctors moved out of the town centre and a well known French Restaurant chain is now there. They have been awarded one of the Godalming Civic Design Awards for their work on the building (2018). The large drapery store of Gammon Brothers at 2, 3 and 4 High Street dominates the right side of the image. At his death on 31 Dec 1907 Mr. Sidney Ballard, his family and some of their drapery assistants lived in two buildings at this end of the High Street, and next to Bridge Street, so it seems likely that Mr. Gammon took over Ballards. Mr. Ballard had served as Mayor of Godalming during the Queen Victoria's Golden Jubilee year of 1887. Sidney Ballard's step-son Arthur Mansfield, son of Ballard's second wife Lydia, was a blouse maker in the shop next door, at what was then number 5. Alfred Gammon was the second son of the late Alderman Ebenezer Gammon, who was Mayor of Godalming in 1898 and 1899. A. J. Gammon's first shop was at the other end of the High Street, at No.40. Following the death of his father in 1908, Alfred continued the family businesses of draper and outfitter at Godalming, Farncombe (11 Farncombe Street), Haslemere and Northchapel. They had also had a shop in Petersfield at one time. The Gammons were running both High Street premises in 1911, but were only at 2-4 High Street in 1913. Just after the outbreak of War in 1914 Godalming Town Council discussed the proposed tenancy of the Old Town Hall. Mr. Gammon wished to rent the upper room but the plan fell through as Gammon would not agree to a clause saying there should be no advertisements on the walls or windows. Alfred Gammon died in 1938 and members of his former staff were amongst the mourners at his funeral. In 1940 Gammons of Godalming and Farncombe held a summer sale. It was clearly not easy to obtain goods as their advertisement read "Despite continual rises in prices and difficulty of supplies, etc., we have obtained many useful stocks of various goods, which we intend selling in this sale at real bargain prices". Gammon's building was replaced in the early 1960s by a shop / office / flat development and a pull in for a bus stop. The Godalming Trust have described the development as one of the most insensitive additions to modern Godalming! A little bit further along on the right was the Kings Arms, the coaching inn where Peter the Great stayed, and the Woolpack which was a public house for many years though it is now an Italian restaurant. "High Street, Godalming". No publisher, No.202. Unused. The 1891 census shows Miss Girdlestone at the Square and next door at No108, closer to Wharf Street, was the baker and confectioner Arthur Singer. She was still at the house in 1901. "Surrey Mirror", 7 Jan 1908 and "Surrey Comet", 11 Jan 1908. Report of Mr. Ballard's funeral. It mentioned that in 1887 he attended the Westminster Abbey Service, before hurrying back to Godalming to join in the town's festivities. He had lost his first wife the year before. 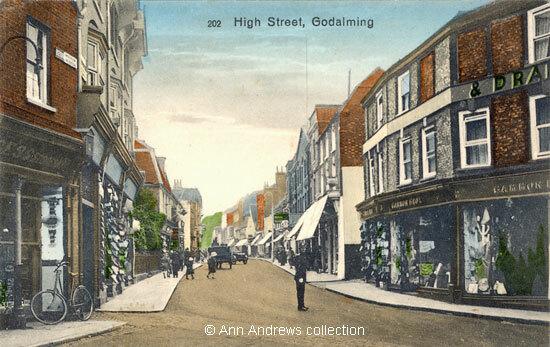 In 1891 (RG12/561 f106 p21 s123 - nos 40,41, 42) he occupied three High Street properties close to the Angel Hotel, which is consistent with a photograph of his shopfront in "Memories of Farncombe and Godalming". In 1901 he inhabited large premises between the King's Arms and Bridge Street. Seven assistant draper's were living in. alongside his family and a housekeeper. Ballard's remained a presence at this end of the High Street until 1929 ("Surrey Advertiser", 3 August 1929. Ballard's, 5 High Street. Clearance Sale). The 1901 census shows him living there, next to the Post Office (not the P.O. of more recent times) still a single man at that time with a number of draper's assistants, a milliner, a boot shop assistant and an apprentice. Plus other staff. "West Sussex Gazette", 28 April 1938. "Kelly's Directory of Surrey", 1891. "Surrey Advertiser", 17 Oct 1914 and 11 Nov 1914. "Surrey Advertiser", 13 July 1940. Sale commences on Thursday next At 9 a.m.
 "A Godalming Walk". The Godalming Trust, 1977. Various reprints and twice amended, the last being 1988 when our copy was produced.